It is hoped a solution will also help to reduce traffic volume and speeds through the village centre. Streets are becoming clogged as the number of cars per household increases, with driveways only having room for one vehicle. Sometimes there are whole streets with no driveways but two or three cars per household. The problems is particularly acute near the station as better train services attract more commuters, but the station car park cannot cope, pushing the problem on to the surrounding streets. District councillor Kate Van Der Plank has launched an urgent call for ideas. “Rather than looking at this piecemeal, on a street-by-street basis, we need to look across the whole village, otherwise we’ll just push the problem from one road to the next,” said Coun Van Der Plank. 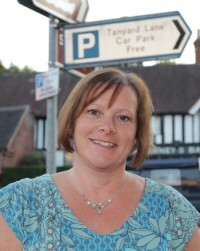 “I would be in favour of much more street parking in the village centre by removing double yellow lines and thinking about traffic flow, parking bays, and direction of parking. The search for ideas is backed by county councillor Charlie Hotham and Alvechurch Parish Council. A meeting is being held this month between the councillors and representatives of Worcestershire Highways to consider ways forward. Ideas received so far by Coun Van Der Plank include having “horizontal” parking, similar to outside the Village Hall, on some wider village roads, such as along Swan Street. This would create a large number of parking spaces and, by narrowing the road, act as a traffic calming measure. It has also been pointed out that any residential parking permits, such as those investigated for Bear Hill, would have to be introduced across the whole village so the problem would not just be pushed to the next street.